When it comes to original audio recordings, the right kind of noise isn’t always the clearest or cleanest sound possible. Forget all those television shows with audio being manipulated and unwanted sound being removed. For our first preservation copy we want our noise to be as truthful to the original as possible, scratches, pops and all. An Archive can have many different kinds of audio, some very common and others that are quite rare. At the BC Archives we have wax cylinders from 1899, wire recordings from the 1940s, sound discs of varying ages, magnetic media and compact discs. With multiple types of media a preservation specialist asks three questions: Do we have a machine that can play these back safely? Is the physical medium stable enough to be played back safely? What preservation work do we need to do in order to get a copy of the content? There are specialized labs that can safely handle some very rare and fragile forms, but this work can be costly and shipping can in some instances be dangerous for the materials. We are quite lucky in that the majority of our holdings are common formats and we have the machines available to get the right kind of noise possible from the original recordings. The archival community and audio specialists throughout the world are a wealth of knowledge and are always willing to give advice and share their knowledge if we run into any surprises. Over the last year one of our preservation specialists has been working on a large collection of audio recordings created by an ethnologist. This collection covers work beginning in 1947 through into the 1970s. Audio recording changed over those 30 years with the ability to record in the field becoming easier as technology evolved from sound discs to open reel-to-reel magnetic tape and then cassette tape. The earliest recordings created in this collection are the sound discs which will be the focus of this article. 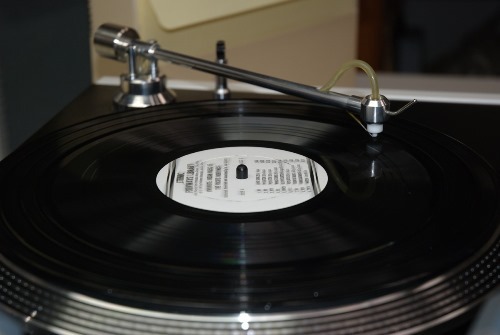 Sound discs in the collection are of varying types: paper-board, transcription discs which have a metal base with a lacquer coating and finally vinyl discs used mainly in the consumer market. Each type of sound disc has a variety of diameters of which five different sizes are represented. In total there are ninety-six individual sound discs, luckily our REK-O-KUT disc player can handle them all! Before putting anything on a machine with moving parts, a conservation assessment must be made of each sound disc; visual assessment looks for cracks, chips, scratches, warping, residue, and dirt which may affect the disc’s ability to be played or may cause damage to the machine and its parts. Once the conservation assessment is complete, each disc is cleaned using a very specialized piece of equipment. Conservation staff research current literature to find the best possible detergent recipes to safely clean the sound discs. Each disc is cleaned, rinsed with distilled water and then vacuum dried. Keith Monk’s archival disc cleaner washing disc using detergent. After cleaning the next step is determining turntable speed for each disc. This will ensure we get the right kind of noise – accurate sound. Did our ethnologist leave us any notes or was there a standard turntable speed used for recording at the time of creation? Apparently not; each sound disc has to be played at various speeds until a natural sound is detected by our preservation specialist. This information is recorded and then used as a starting point for similar sound discs within the collection, with minor adjustments as required. 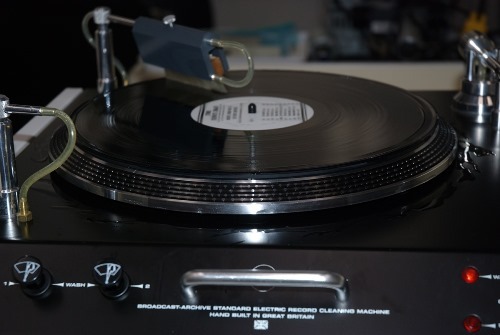 In conjunction with finding the right turntable speed, the shape and width of the grooves on a disc will determine which of the 14 stylus types we have on hand to use. Since our ethnologist wasn’t a sound technician the groove quality is uneven (different between discs and even on the same disc). Uneven grooves prevent even the best stylus from running smoothly in the groove or as our preservation specialist calls it, running in the sweet spot. In addition to choosing the best stylus, the arm holding that stylus must have the correct weight, allowing the right pressure to hold the stylus in the groove. Too light and information will be missed, too heavy and the stylus will be worn down or damage the disc. Each unique stylus used needs to have the arm weight adjusted. Since our sound discs are old and sometimes warped, the arm weight doesn’t always hold that stylus down even with the best of efforts. An additional step taken is called anti-skate. This feature puts tension on the arm so the stylus doesn’t skip out of any uneven grooves. Vacuum head to remove water from final rinse process. Once all these requirements are determined, the original sound disc is ready to be played to optimize the right kind of noise. Audio levels are monitored and adjusted in real time and the original recording copied onto Archival Standard CDs to provide a master. This will serve to create copies for researchers, and the content migrated onto servers for long-term storage. This article first appeared in Curious Quarterly.